Springtime is crappie time wherever you live. But its arrival is especially welcome in the top half of the U.S. where, during the long winter season, many anglers have grown weary of probing deep lake basins through holes in the ice. It’s the time when fishermen trade their snowsuits for lighter layers of clothing and un-insulated footwear; when their eardrums once again vibrate to the steady hum of an electric motor; and when they can pick up a fishing rod that’s actually made for jigging and casting. People mark spring’s arrival many ways – by a date on the calendar, when the marsh marigolds emerge, or when the first robin appears. But to a crappie angler, spring hasn’t sprung until water temperatures reach 58 degrees, or so, and the fish begin to abandon their cavernous winter sanctuaries in favor of the shallows where they’ll feed and spawn. In the Deep South, the prespawn period can occur in December. In the zone that roughly cuts a swath from Ohio to Kansas and beyond, it’s happening now, depending on local weather conditions. Farther north, anglers are still awaiting the annual migration. 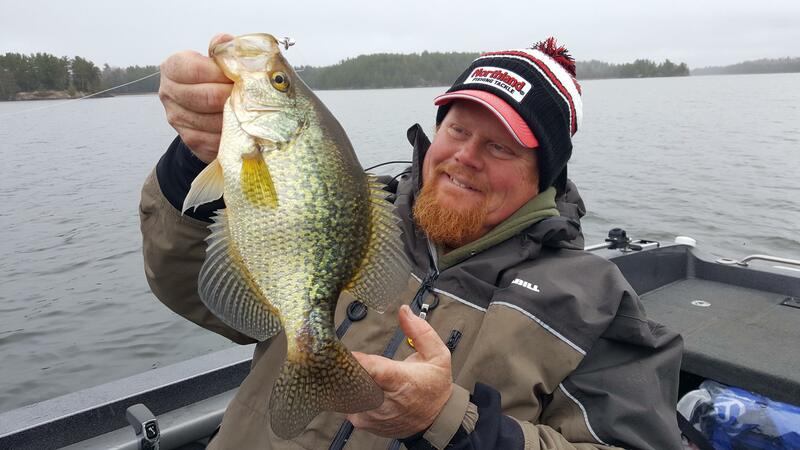 The first step in locating springtime crappies is to identify likely spawning areas – shallow coves and back bays that are protected from the wind and warm up quickly. Brush, lily pads or bulrushes – or other reed-type plants such as maidencane that grow on a firm bottom – provide optimal spawning cover. Spawning depths range depending on water clarity. The eggs need warming sunlight to mature, so nests will be shallower in murky water; deeper in clear water. In general, expect to find beds somewhere between 2 and 8 feet, but don’t be surprised if they are shallower or deeper. Until the shallows warm up enough for nest building, crappies stage along the first drop-off from the spawning grounds and make forays into the shallows to feed (see map above). Changing weather conditions, which is typical for the early spring, will often push them up shallow on mild days and force them back during cooling trends. Once a pod of fish is located, it’s time to pick up a jig. Very often a swimming retrieve with something like a Northland Mimic Minnow Fry (above) allows an angler to pick off aggressive fish near the edge of or overtop the school without disrupting the pod. In murky water, it never hurts to add some flash to the offering with a chin-spinner jig such as a Thumper Crappie King (below) and if a less lively presentation is needed, dangle a jig tipped with a live minnow, or a basic hook-and-minnow, under a slip float just above the school. Males move into the spawning shallows and begin building nests when the water temp reaches the low 60s, and spawning activity usually peaks when it approaches 70 degrees. While individual female fish may remain in the spawning grounds a day or two, retiring to deeper cover after depositing their eggs, males hang around to guard the nest and fry. Though the female’s stay is usually brief, remember that all fish don’t spawn at the same time, meaning the area will likely hold larger female fish for several days, maybe as long as a couple of weeks. Again, swimming a jig tipped with a curly tail, paddle tail or tube body through reeds, pads or brush may be the presentation of the day for crappies about to spawn or tending nests. If not, try slowly moving a jig under a fixed float along the edges of the cover. Pause the rig often to allow the jig to swing slowly back to vertical. Sometimes it’s best to go in after them, though. Using a long pole – 10 to 14 feet is very common – anglers dabble jigs vertically through the reeds or into brush-rimmed pockets to catch fish that can’t be approached with a cast. During the spawn, and for some time afterward, crappies can be found in deeper weeds, brush or other available cover just outside the nesting area. Freshly spawned females are first to arrive, followed by male fish that have finished tending the young. Here, too, a tiny crankbait or a jig, swimming or under a float, will catch these fish. If an angler finds a prime spot during this season of plenty, it’s not difficult to catch loads of fish day after day. So, use commonsense when it comes to deciding what goes home in the livewell. Crappies are the among the most delicious of all gamefish, and keeping enough to feed the family a few meals is a good thing. But remember that crappies tend to use the same spawning areas over and over again – and you want to be able to come back and do it all over again next year.